Wouldn’t it be great if people were given a second chance by dogs that were given a second chance? That is what they do at Canine Angels, a nonprofit organization that rescues dogs from the shelter, then trains them to be service dogs for disabled veterans. 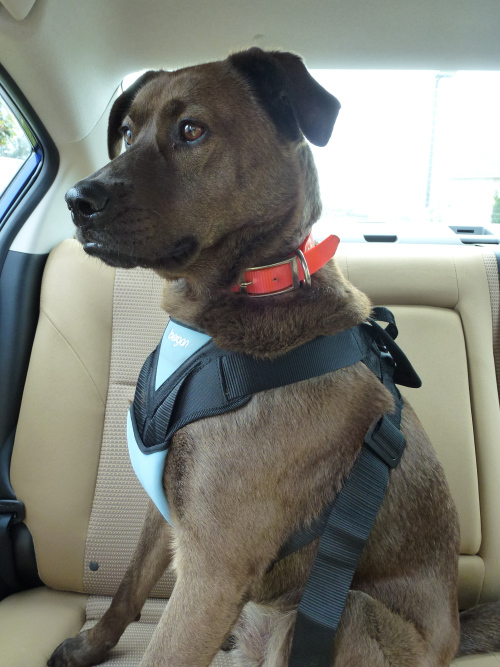 I had this wonderful opportunity to learn about Canine Angels when someone offered to do a review of my dog car harnesses. This dog Bobo is being trained to be a service dog. Bobo is an absolutely beautiful dog that might not have been given a second chance if he hadn’t been selected by Canine Angels. 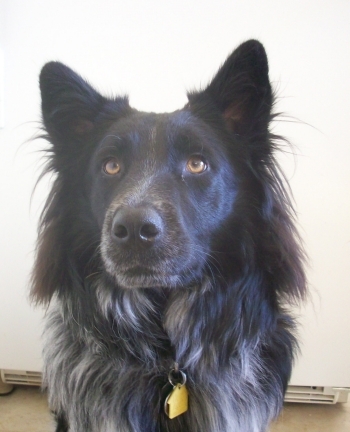 One of the stories featured on the Canine Angels website is about Dave and Diamond. Says Dave’s wife, Virginia, “Usually a veteran trains with several dogs, working up to his personal dog, but in our case, Diamond “picked” Dave during his interview and would not leave his side.” This means that while Diamond is being trained, so is Dave. It is a challenge, a journey, as Rick Kaplan the founder tells them. But it has already made a big difference. Read more HERE (this story is on a pdf file that will download). Diamond and Bobo are just a couple of the many dogs being trained right now. The founder currently has a number of dogs that he is working with 24/7. 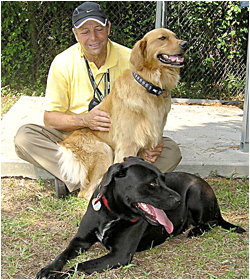 Check out this interview of Rick Kaplan with his canine-angels-in-training. 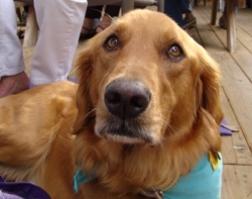 Canine Angels also trains dogs as therapy dogs. Meet Lady, Canine Angels’ first therapy dog. Go check out the Canine Angels‘ website to find out more. Be sure to make a donation too! Clicking the image below will take you to the Canine Angels donation page. Are you sick of winter yet? Maya & Pierson aren’t. 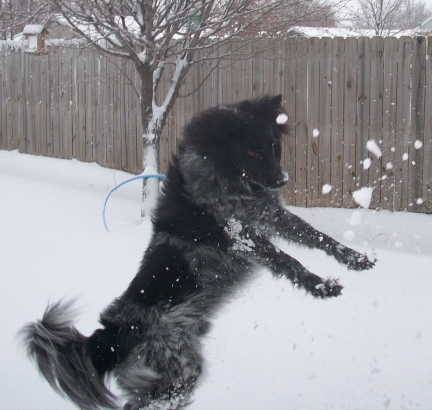 Check out these really adorable (and funny) photos of my dogs playing in the snow on Sunday, March 24th. 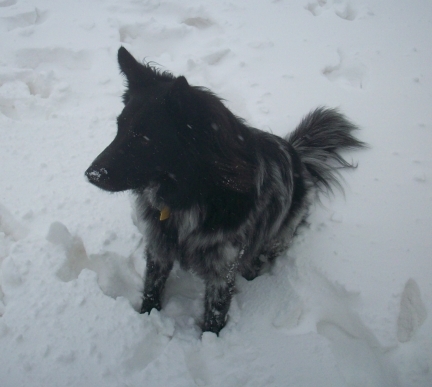 Pierson sitting in the snow, wondering which snow drift might be the deepest. Pierson misses the snowball I threw and it smashes apart. 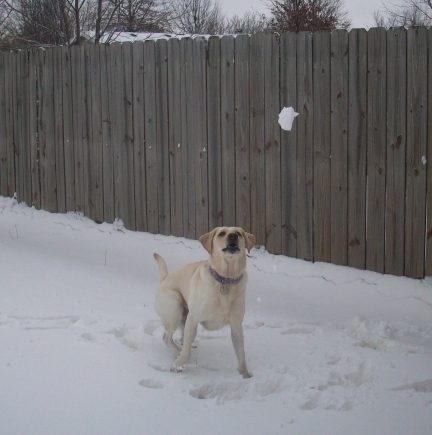 My dog Pierson looks funny as he tries to catch a snowball! 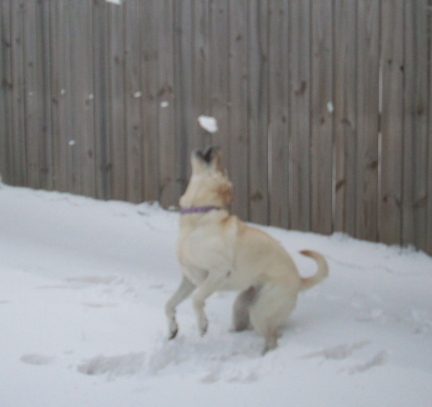 My dog Maya prepares to catch a snowball. 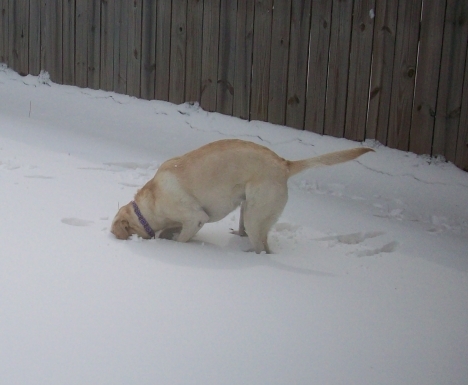 Maya is looking for the snowball I threw (and she didn’t catch). 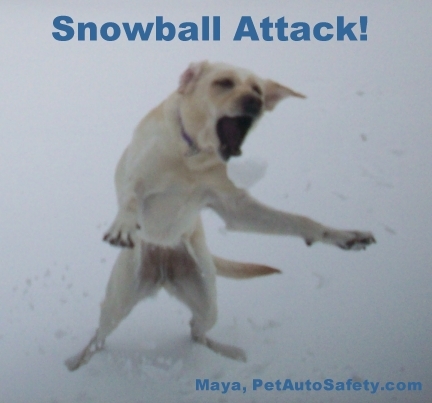 Maya’s almost got that snowball! LOL! 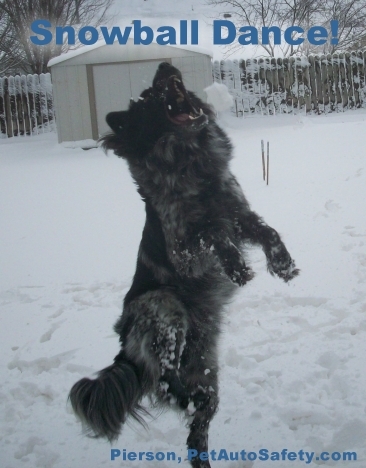 My dog Maya looks funny as she is about to catch a snowball. 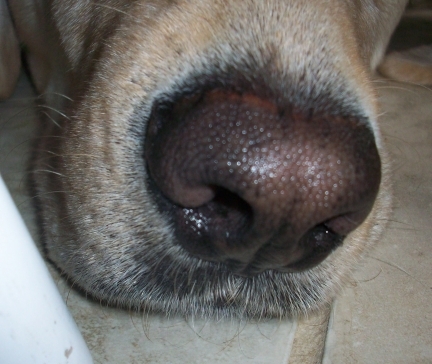 For more great photos of dogs, check out the Wordless Wednesday blog hop link below. Following My Own Dog Training Tips? I have gotten really lazy this winter. I’d rather play with my dogs indoors or put on a jacket to play with them a few minutes outdoors than take them for a walk in the cold weather. This means any gains I have made by the end of fall with leash training are forgotten and I have to practically start all over again in the spring. This same logic about frequency and consistency applies to how my dogs behave around other dogs. Since they haven’t been around other dogs much this winter, their behavior has gotten out of control again. In the fall, I took Pierson downtown once a week so I could help Dogtoberfest sell calendars to raise money for the Lawrence Humane Society. This was outdoors so we saw a lot of people and quite a few dogs. Pierson was naughty at times, but by the final week he was doing great. When winter came, I didn’t keep it up. Now, on those rare times in the winter when we do go for a walk, he goes absolutely nuts when he sees another dog. Maya does it too, although her reason is because she is so excited, not because she is being aggressive. 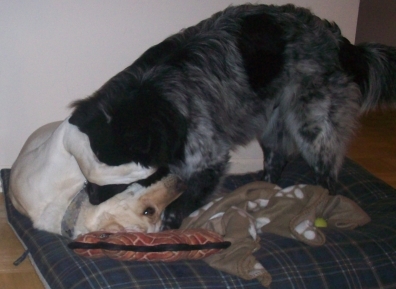 If I had been exposing Maya and Pierson to other dogs more often over winter, would they be acting this way? Probably not. I just realized that Pierson has me trained. I don’t like my dogs to disturb my neighbors so if they start barking when they are outside, I make them come back inside. Yesterday, Pierson decided to start barking. It sounded like he was barking at something, generally at the squirrel that lives next door or at a person walking by the house. But when I went to go get him, he was sitting by the back door. Booger. He was barking at me to let him in! So there you have it. I am great at giving advice on how to train dogs, but not very good at taking my own advice. I know what to do, but have gotten lazy about doing it. And now I am paying the price. Winter is almost over so no more excuses. It’s time to get off my behind and put my words into practice! 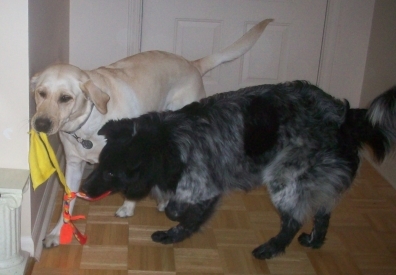 Did you see Maya’s review of the NiteDawg light up dog collar from March 2nd? It was pretty cool, right? Except it probably wouldn’t work as well as on dogs like my Pierson with long hair. Well, it just so happens that Pierson won his own light up dog collar shortly after! He won it from the Jones Natural Chews blog! (BTW, if you haven’t seen this blog, it’s fun and super funny.) The light from Pierson’s collar hangs down so his hair doesn’t obscure it. 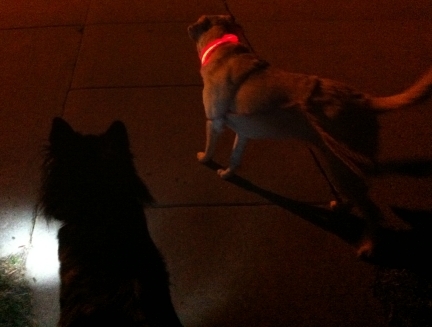 Here are the pet photos of both Maya & Pierson wearing their light up dog collars… into the night. See how Maya’s dog collar glows around her neck while Pierson’s shines a light? 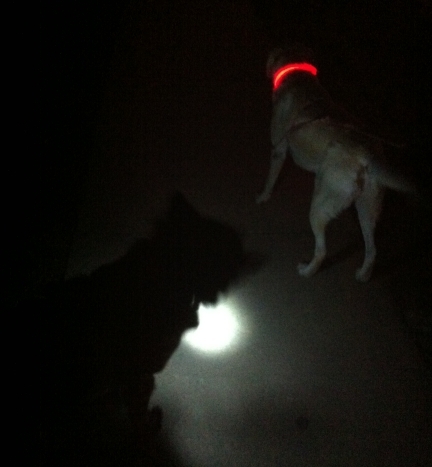 Despite their light up dog collars, I still managed to trip in the dark. 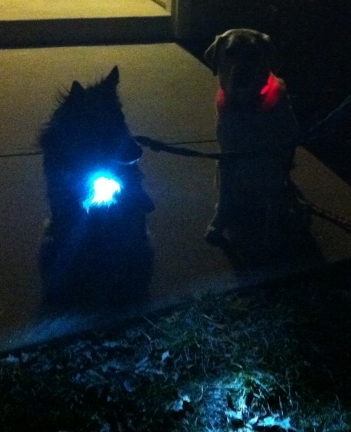 Maya’s dog collar glows while Pierson’s shines a light. Oooh, scary shadows. Poor old noseless Baxter and new Baxter. People, do you have any of your toys left from your childhood? I do. It is the Baxter stuffed dog and I’ve had it for 30 years now. It is not just special to me because it is a stuffed dog. I mean, for someone who loves dogs, every stuffed dog toy is special, right? 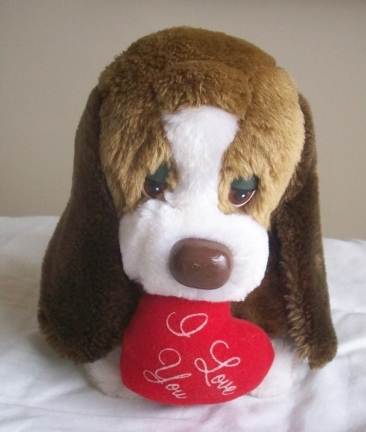 But the Baxter stuffed dog is special for two other very important reasons. In December 1982, I got the Baxter stuffed dog. You can see me holding it in this old photograph. 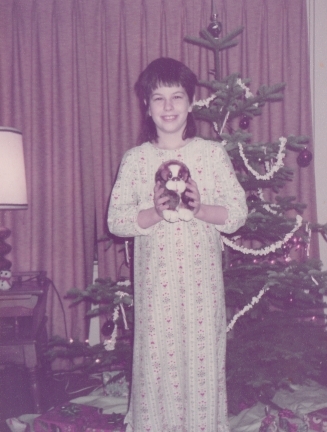 This is me in 1982 with my new stuffed dog named Baxter. Don’t make fun of my hair. 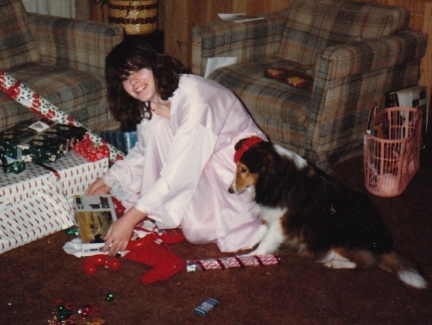 If memory serves me correctly, I got my dog Cassie in November of 1983. Cassie was a year old at the time, so that would put her as being born at around the same time as I got the stuffed dog Baxter. 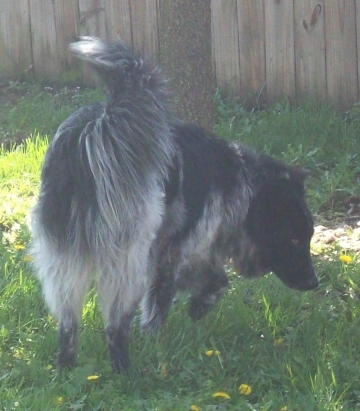 And even though Baxter was not the same breed as my real dog Cassie, for whatever reason I associated it with her. In my child-like mind, Cassie and Baxter were brother and sister. 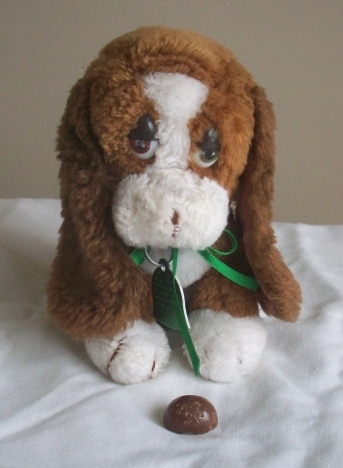 So when Cassie died in 1996, I tied her dog tags to the Baxter stuffed dog. This is Cassie and I in 1987. Cassie was a very special friend. Again, don’t make fun of my hair. Something happened to Baxter a few years later that makes him even more special. My beloved dog Sephi chewed his nose off! Thank goodness, that is all she did. She would have done more damage if I hadn’t rescued him. So Baxter no longer has a nose. Well, I still have his nose. I just haven’t glued it back on. If you haven’t guessed, the second reason Baxter is so special to me is because he has also become a memory for Sephi (who passed away in 2011). 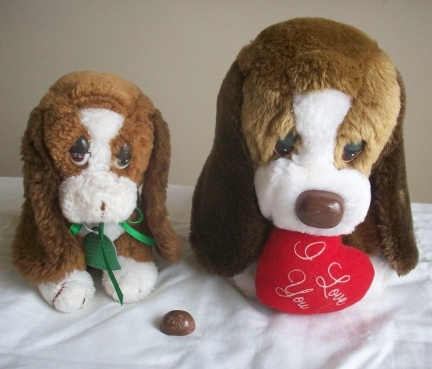 This is the same Baxter stuffed dog toy from the 1982 photograph. You can see Cassie’s dog tags tied to it. Why is the stuffed dog called Baxter? That is the name on his manufacturer’s tag. And apparently this stuffed dog is so popular, that the company has made a number of them. I even found this newer version of the Baxter stuffed dog at a garage sale! I also found the older version (vintage) selling on ebay for almost $40!!! This is the new Baxter stuffed dog that I recently found at a garage sale. As you can see, this stuffed dog is named Baxter. Do you have any special childhood toys? Any which remind you of a beloved pet? 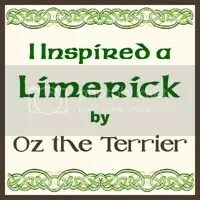 Oz the Terrier Wrote a Limerick About Pierson! An original poem by Oz the Terrier; re-posted with permission, in its entirety, as originally posted on www.oztheterrier.com. 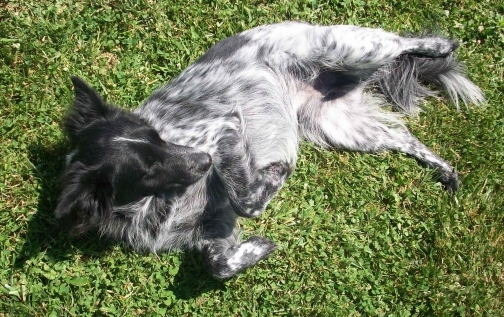 What is it about our four-legged family members that makes us want to call them silly names? Perhaps I can illustrate by showing you some pet photos of Maya and Pierson’s nicknames. 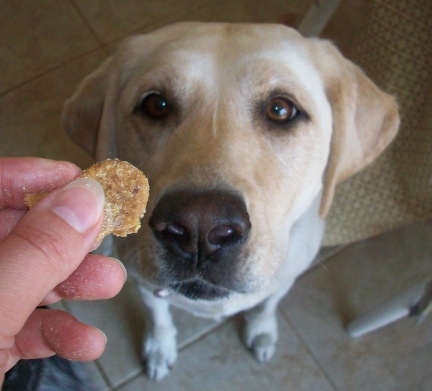 “I will do anything for a treat!” – Yep, definitely a brown-noser. Little Miss Trouble or Miss Troublesome. Those are just a few of the names I call Maya & Pierson. What are some of the funny names you call your dogs or cats? Comment below, then check out other great pet photos from the Wordless Wednesday blog hop link below. Maya no longer has to go in her pet crate, but she does so because she wants to. 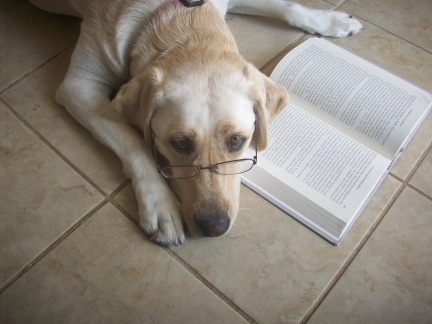 I recently joined this great G+ discussion group for dog psychology. And I’m learning so much! Not only have I gotten ideas for how to work with Pierson’s dog aggression issues, but I’ve also gotten a great perspective from other dog people all around the world. A topic that was discussed recently was crate training. When the topic was brought up, all the strongest advocates for crate training were from those living in the US. Many outside the US felt that using a pet crate was unnecessary. From their perspective, this tool for training is an American fad. Why is crate training your dog so popular in the US but not elsewhere like in Europe where people there love and care for their pets just as much as we do? Someone in the G+ discussion mentioned Cesar Milan. 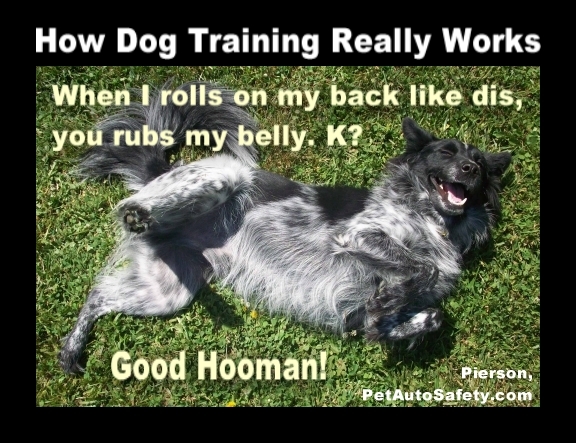 We’ve heard from numerous famous dog trainers about how great it is and it has caught on like wildfire. We hear all the hype about how helpful it is for potty training. We hear about how much dogs enjoy the makeshift ‘den’. 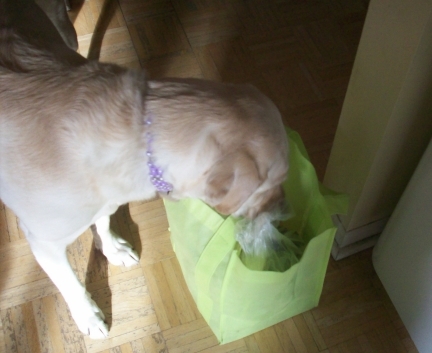 And we hear it is a great behavioral solution to keep dogs from chewing on their stuff when they go to work all day. And sometimes the message goes so far as to say there is nothing wrong with leaving a dog in a pet crate all day. Some of these things can be true. But the pet crate is merely one of many tools you can use for dog training. How many people do you know use the dog kennel as the one and only training method and as a substitute for other training? Because people are busy, they leave the dog in the crate all day while they go to work and don’t do much obedience training at all. For example, instead of training a dog to chew on his own toys and not your stuff, some people simply put their dog in a crate. Instead of rewarding a dog for going potty outside, some people only potty train by leaving their dog in the crate. And instead of teaching a dog not to get on the furniture, the dog is left in the crate so that he can’t get on the furniture. Crate training your dog can be a very helpful tool. But you have to train them outside of the crate too if you ever expect them to really learn to behave properly. 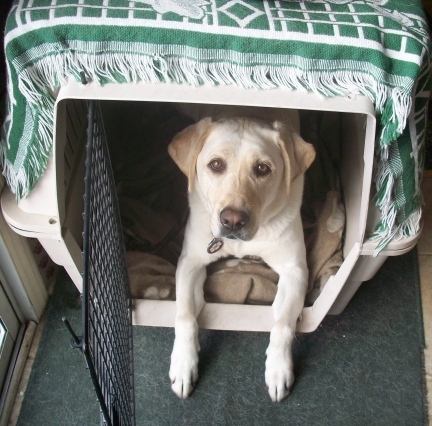 Have your dog stay in the crate when you aren’t home, but train them when you are home. Teach them the boundaries, like not being allowed on furniture. Give them alternatives to chewing on your stuff. Teach them that going potty outdoors is the best behavior. And test them from time to time by leaving them out of the pet crate when you are gone for short periods to see what they do. There may be times when you have no choice but to leave your dog in a crate all day. I’ve done it on accident when I spent longer away than intended and my pet sitter wasn’t available. If you work all day and you don’t work close enough to home to visit your dog on your lunch break, make arrangements with a pet sitter. 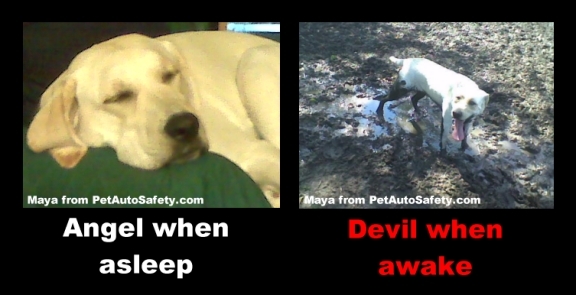 While a dog may be comfortable in their pet crate, it can’t be good to leave them in there for 9 to 10 hours straight. 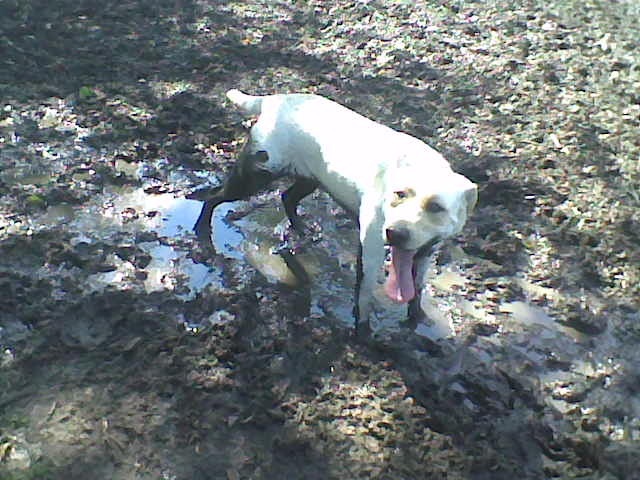 Maya was the first and only dog I have ever crate trained. It did have great benefits in that it helped me potty train her and helped to keep her from chewing up my stuff when I wasn’t home. But because I also trained her in other ways, she no longer has to be locked in her crate. She goes in there on her own when she feels like it. It still is her security ‘den’. But because I can trust her not to get on the furniture or get into things when I am not home, she doesn’t have to go into her dog kennel unless she wants to. Trying to crate train Pierson ended in disaster. He tried so desperately to escape the pet crate that I believe the bloody nose he got the following morning was a result of that fierce desperation. So Pierson was trained without one and he is now just as well-behaved and trustworthy as Maya. If you are crate training your dog or if you promote using the dog kennel for training, remember that other obedience training methods must be used in conjunction. Don’t use the pet carrier as a substitute for dog training. 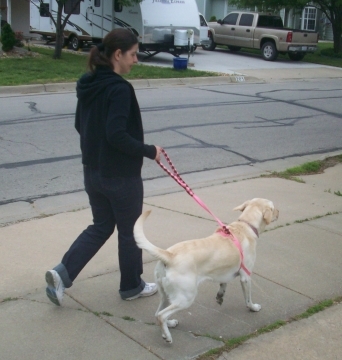 Getting a dog means taking responsibility and taking responsibility means taking the time to train your dog without taking shortcuts. Positive reinforcement training is a great bonding experience and a fantastic way to get a well-behaved dog that doesn’t have to stay in the crate if he doesn’t want to. Many of you may have noticed that I don’t always reply to the comments you leave on my posts. But I want you to know that I am reading and I am enjoying your comments immensely. I just don’t always know what to say in reply to your reply. If you say that Maya and Pierson are so cute in those photos, I feel silly replying, “I know” or “Aren’t they?”. I could say “Thanks” and perhaps I should. While I may not always reply to your comments on my blog, I do enjoy going out to your blogs and commenting on your adorable fur family members (Snoopy, Roxy, Torrey, Pixel, Litchi, Tanner, Oliver, Dougie, Dakota, Cinnamon, Clowie, Eko, Hawk, Thunder, Storm, Freighter, Leroy, Sherman, Mollie, Alfie, Oz, Patches, Flash, Petey, Maggie, Kirby… OMDog I hope I didn’t forget anyone!!!). You may not always notice my reply on your blogs because sometimes I put in this blog title in the URL section, sometimes I put in my petautosafetyblog.com URL, and sometimes I just put the petautosafety.com retail URL. Anyway, I just wanted to let you all know how much I appreciate you stopping by. And thank you so much for all the wonderful comments!!! If any of you would like me to reply to your comments, I’d be more than happy to. I know as bloggers that we are already bogged down with tons of email alerts. So some of you may not be concerned about whether I reply or not. But if you’d like me to, just let me know. You can let me know here by commenting on this post or email me at naturebydawn@aol.com so that your preference is kept private. Happy Wordless Wednesday! To see more great pet photos from the blog hop, check out the link below.